Sen. Tim Kaine's wife resigned as Virginia's secretary of education. Virginia Gov. Terry McAuliffe's office announced Tuesday that Anne Holton stepped down from the cabinet-level post because her husband had been picked to be Hillary Clinton's running mate. McAuliffe said Holton's resignation was effective Monday. Holton was the No. 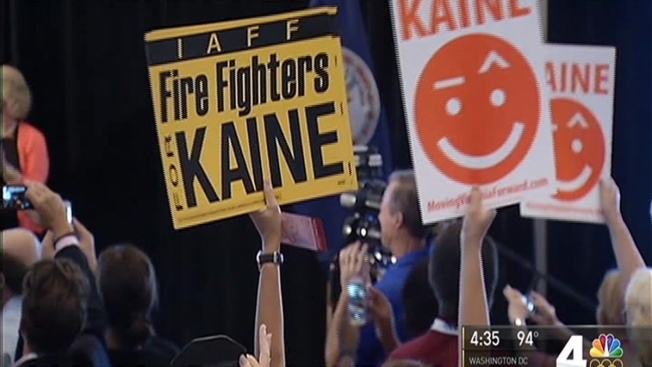 1 topic as Kaine met with Virginia Democrats Wednesday for the first time since joining the presidential ticket. He told delegates his first call was to his wife after he said yes to Clinton. He asked if she was ready for a new adventure, and she said absolutely. Clinton's team made it clear they had plans for Holton, too, Kaine said. "They said, 'Tim, we love you but we really love Anne and we want every last minute that she can give us,'" he said. Right after the breakfast with the Virginia delegation, Holton visited a Philadelphia preschool nutrition program with Virginia first lady Dorothy McAuliffe, first huddling with leaders there, then dropping in on lunch. She told News4 that she's ready and excited for what's ahead and that she and her husband are having fun. Holton is the daughter of former Gov. Linwood Holton and is a longtime child advocate and former Richmond Juvenile and Domestic Relations Court judge. Prior to joining the McAuliffe administration, Holton directed a Virginia Community College System initiative that helps young people who are aging out of foster care continue their education. She and Kaine met at Harvard Law School and have three children. McAuliffe announced Holton's replacement is Dietra Trent, a former deputy secretary of education.